A sadistic gang of thugs goes on the rampage. 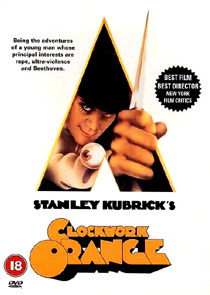 If you were born in the sixties or seventies, you probably never thought you'd see the day when you could walk into your local video emporium and legally buy an uncut copy of A Clockwork Orange, unarguably one of the most controversial films ever made. Now it sits on the shelves, alongside The Exorcist and Natural Born Killers, and yet the world continues to turn. Kubrick’s chilling story of gang violence and state control has lost none of its power to shock and thrill, and the pristine new DVD makes the film shine like never before. Certainly this disc will be a revelation for the legions of fans who made do with bootleg recordings and pre-recorded VHS copies imported from more liberal territories: the film looks like it’s just been liberated from the Warner vaults after being on ice for thirty years. It also features a delicate Dolby Digital 5.1 mix (at 384kbps), which broadens the soundstage, and adds new weight to the score. Warner is to be congratulated for including the film’s original mono mix, which will please purists. Sadly the only bonus feature is the film’s hyper-kinetic trailer. Buy it now, before they change their mind!